It was a fine autumn evening, and a faint sunlight shone on the yellow walls of the old deserted house, and showed the patches of gangrenous decay, and all the stains, the black drift of rain from the broken pipes, the scabrous blots where the bare bricks were exposed, the green weeping of a gaunt laburnum that stood beside the porch, and ragged marks near the ground where the reeking clay was gaining on the worn foundations. It was a queer rambling old place, the centre perhaps two hundred years old, with dormer windows sloping from the tiled roof, and on each side there were Georgian wings; bow windows had been carried up to the first floor, and two dome-like cupolas that had once been painted a bright green were now gray and neutral. Broken urns lay upon the path, and a heavy mist seemed to rise from the unctuous clay; the neglected shrubberies, grown all tangled and unshapen, smelt dank and evil, and there was an atmosphere all about the deserted mansion that proposed thoughts of an opened grave. By the mistaken benevolence of deceased relatives both young men were placed out of reach of hunger, and so, meditating high achievements, idled their time pleasantly away, and revelled in the careless joys of a Bohemianism devoid of the sharp seasoning of adversity. It seems ever harder now for this to happen, London of Machen’s time seems to lend itself to such possibilities much easier. Perhaps though, as Raymond Williams writes, each generation turns from the ugliness and meanness of the present towards a nostalgia of the past. But some things don’t seem to change, it is still true that almost everyone comes to London at some point — and if not London, then the big city near their town or village. Youth from all over the country come to be part of the action, to remake themselves, become something they can’t become within the confines of small tight communities. I felt that there was nothing for me to do in the country, and as usually happens in such eases, London drew me like a magnet. One day in August, in the early morning, while the dew still glittered on the turf, and on the high green banks of the lane, a neighbor drove me to the railway station, and I bade good-bye to the land of the broad moors and unearthly battlements of the wild tors. It was six o’clock as we neared London; the faint sickly fume of the brickfields about Acton came in puffs through the open window, and a mist was rising from the ground. Presently the brief view of successive streets, prim and uniform, struck me with a sense of monotony; the hot air seemed to grow hotter; and when we had rolled beneath the dismal and squalid houses, whose dirty and neglected back yards border the line near Paddington, I felt as if I should be stifled in this fainting breath of London. I got a hansom and drove off, and every street increased my gloom; gray houses with blinds drawn down, whole thoroughfares almost desolate, and the foot-passengers who seemed to stagger wearily along rather than walk, all made me feel a sinking at heart. I put up for the night at a small hotel in a street leading from the Strand, where my father had stayed on his few brief visits to town; and when I went out after dinner, the real gayety and bustle of the Strand and Fleet Street could cheer me but little, for in all this great city there was no single human being whom I could claim even as an acquaintance. For all its lure, there is something lost. There are desires unfulfilled, hopes destroyed, lives that never reached their promise. It takes a long time to know it, much less achieve anything there. Machen does not just sharpen his wit on Dyson and Phillips, but on London’s monotony and mean streets as well, never losing sight of this veil of gothic prose and imaginings that he is pulling over it. “I see you can find the picturesque in London,” he said. “To me this great town is as I see it is to you, the study and the love of life. Yet how few there are that can pierce the veils of apparent monotony and meanness! I have read in a paper which is said to have the largest circulation in the world, a comparison between the aspects of London and Paris, a comparison which should be positively laureat, as the great masterpiece of fatuous stupidity. Conceive if you can a human being of ordinary intelligence preferring the Boulevards to our London streets; imagine a man calling for the wholesale destruction of our most charming city, in order that the dull uniformity of that whited sepulchre called Paris should be reproduced here in London. Is it not positively incredible?” … They had lingered at the corner of a street on the north side of the Strand, enjoying the contrasts and the glamour of the scene. Dyson pointed the way with a gesture, and they strolled up the comparatively deserted streets, slanting a little to the right, and thus arriving at Dyson’s lodging on the verge of Bloomsbury. Mr. Burton took a comfortable armchair by the open window, while Dyson lit the candles and produced the whiskey and soda and cigarettes. And this paean to a suburb? This evocation of phantasy and gothic horror in such surroundings left by everyone else to everyday staid graspings after economic prosperity and their meanness? The chance happening of adventure here? Happiness. Before me was the long suburban street, its dreary distance marked by rows of twinkling lamps, and the air was poisoned by the faint sickly smell of burning bricks; it was not a cheerful prospect by any means, and I had to walk through nine miles of such streets, deserted as those of Pompeii. I knew pretty well what direction to take; so I set out wearily, looking at the stretch of lamps vanishing in perspective; and as I walked, street after street branched off to right and left,–some far reaching to distances that seemed endless, communicating with, other systems of thoroughfare; and some mere protoplasmic streets, beginning in orderly fashion with serried two-storied houses, and ending suddenly in waste, and pits, and rubbish heaps, and fields whence the magic had departed. I have spoken of systems of thoroughfare, and I assure you that, walking alone through these silent places, I felt phantasy growing on me, and some glamour of the infinite. There was here. I felt, an immensity as in the outer void, of the universe. I passed from unknown to unknown, my way marked by lamps like stars, and on either band was an unknown world where myriads of men dwelt and slept, street leading into street, as it seemed to world’s end. At first the road by which I was travelling was lined with houses of unutterable monotony,–a wall of gray brick pierced by two stories of windows, drawn close to the very pavement. But by degrees I noticed an improvement: there were gardens, and these grew larger. The suburban builder began to allow himself a wider scope; and for a certain distance each flight of steps was guarded by twin lions of plaster, and scents of flowers prevailed over the fume of heated bricks. The road began to climb a hill, and, looking up a side street, I saw the half moon rise over plane-trees, and there on the other side was as if a white cloud had fallen, and the air around it was sweetened as with incense; it was a may-tree in full bloom. I pressed on stubbornly, listening for the wheels and the clatter of some belated hansom; but into that land of men who go to the city in the morning and return in the evening, the hansom rarely enters, and I had resigned myself once more to the walk, when I suddenly became aware that some one was advancing to meet me along the sidewalk. The man was strolling rather aimlessly; and though the time and the place would have allowed an unconventional style of dress, he was vested in the ordinary frock coat, black tie, and silk hat of civilization. of early summer, where old elms held memories of the open fields, where there was yet sweet grass to walk on. The houses in Abingdon Grove belonged chiefly to the nondescript stucco period of thirty-five years ago, tolerably built with passable accommodation for moderate incomes; they had largely passed into the state of lodgings, and cards bearing the inscription “Furnished Apartments” were not infrequent over the doors. Here, then, in a house of sufficiently good appearance, Mr. Russell had established himself; for he looked upon the traditional dirt and squalor of Grub Street as a false and obsolete convention, and preferred, as he said, to live within sight of green leaves. Indeed, from his room one had a magnificent view of a long line of gardens, and a screen of poplars shut out the melancholy back premises of Wilton Street during the summer months. Mr. Russell lived chiefly on bread and tea, for his means were of the smallest; but when Dyson came to see him, he would send out the slavey for six-ale, and Dyson was always at liberty to smoke as much of his own tobacco as he pleased. void and elements of brick-work, the passages and unmade roads behind great factory walls, encumbered with the refuse of the neighborhood, forlorn, ill-lighted, and desperate. A brief turn, and there rose before him the unexpected, a hill suddenly lifted from the level ground, its steep ascent marked by the lighted lamps, and eager as an explorer Dyson found his way to the place, wondering where his crooked paths had brought him. Here all was again decorous, but hideous in the extreme. The builder, some one lost in the deep gloom of the early ‘twenties, had conceived the idea of twin villas in gray brick, shaped in a manner to recall the outlines of the Parthenon, each with its classic form broadly marked with raised bands of stucco. The name of the street was all strange, and for a further surprise, the top of the hill was crowned with an irregular plot of grass and fading trees, called a square, and here again the Parthenon-motive had persisted. Beyond the streets were curious, wild in their irregularities, here a row of sordid, dingy dwellings, dirty and disreputable in appearance, and there, without warning, stood a house genteel and prim with wire blinds and brazen knocker, as clean and trim as if it had been the doctor’s house in some benighted little country town. These surprises and discoveries began to exhaust Dyson, and he hailed with delight the blazing windows of a public-house, and went in with the intention of testing the beverage provided for the dwellers in this region, as remote as Libya and Pamphylia and the parts about Mesopotamia. The babble of voices from within warned him that he was about to assist at the true parliament of the London workman, and he looked about him for that more retired entrance called private. When he had settled himself on an exiguous bench, and had ordered some beer, he began to listen to the jangling talk in the public bar beyond; it was a senseless argument, alternately furious and maudlin, with appeals to Bill and Tom, and mediæval survivals of speech, words that Chaucer wrote belched out with zeal and relish, and the din of pots jerked down and coppers rapped smartly on the zinc counter made a thorough bass for it all. 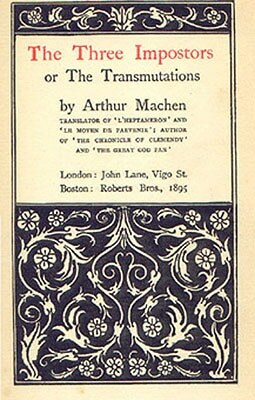 This sums up so many of my own walks in a way: ‘…he made a whole district the cabinet of his studies, and vowed he would come again…’ I wish Arthur Machen had made more money, had not inhabited this shadowy place of Grub Street writers, had been able to write more of what he wanted to write. But perhaps then I would not have loved it quite so much. He tries to escape with us the dirt and dreary realities of the city, the hackwork. I think he succeeds here. But we both of us know all that we are escaping is still there.